This entry was posted in New and Noteworthy Blog on April 15, 2016 by Lauren Pearson. 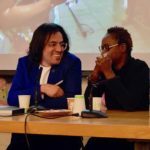 The ARC Fellowship has enabled us to expand our understanding of poetry and performance across disparate zones of incarceration, statelessness, and occupation. Maria Faini has focused on a selection of her dissertation, tentatively titled “Relational Poetics.” She centers an ethical sensibility of the occupying subject to analyze collaborative arts projects that render both impenetrable and porous the affective and experiential divide between military guard and occupied prisoner. Faini’s main focus is abu ghraib arias, Arab American poet Philip Metres’s collaborative chapbook of poems comprised of excerpts from texts such as U.S. soldier emails, testimonies from Abu Ghraib torture victims, the Standard Operating Procedure for Camp Echo at Guantanamo Bay, the Bible, and the Code of Hammurabi, to name a few. 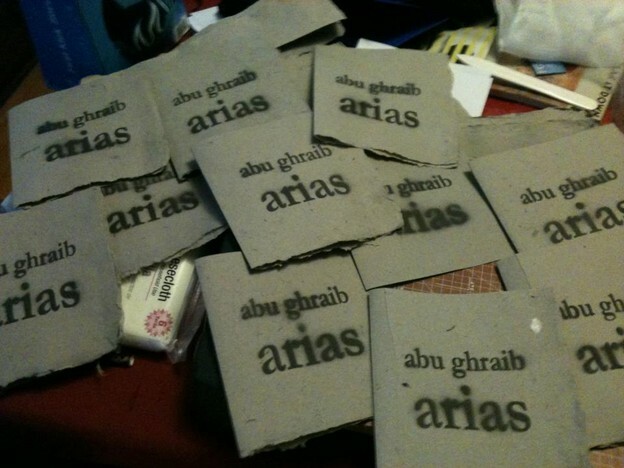 arias’s first edition was made with combat paper from the pulped uniforms of Army veteran Chris Arendt, who was stationed at Guantanamo Bay. Part of Faini’s presentation to the group focused on this collaboration, examining what it means to use combat paper as a foundation for a poetic project like arias. arias is old and new media, agonistic histories operating in discursive exchange that reverberates in despairing yet pleasurable registers. Following Shannon Jackson’s discussion of the material and social supports necessary for art events to exist and expand, Faini reads arias as apprehending a mode of antagonistic engagement and offers a theory of collaborative poetics that unsettles the effects of the colonial difference in military occupation. This collaboration, she argues, enacts an alternative form of artisanal destruction, a remembrance that works through coloniality to decolonial ends. As a contrast to Metres’ poetry, Feldman turned to another collaborative performance, one that also approaches the archives of the U.S. war prison as a site for critical recasting. The particular document of interest is the Joint Task Force Guantanamo Bay standard operating procedure known as “medical management of detainees on hunger strike.” Elements of this document served as a script for a video produced by Reprieve, a Britain-based legal advocacy organization that has taken on a range of legal cases on behalf detainees at Guantanamo Bay, as well as victims of drone strikes in Afghanistan and Pakistan. As part of their advocacy work, Reprieve produces what Feldman calls “critical awareness media” to bring attention to ongoing human rights abuses that they were also litigating in various settings. 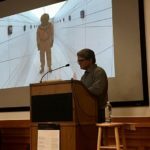 Drawing on recent work in visual studies, Feldman theorizes “critical awareness media” as forms of media production that postulate knowledge about the U.S. homeland security state and the U.S. war on terror. What kinds of visualizing strategies are producers of critical awareness media utilizing, and to what effect? What are the grids of intelligibility through which such campaigns are rendered and understood? Plumbing this question opens out how avowedly anti-racist and anti-war human rights campaigns are implicated in liberal modernity’s ongoing, if also mutable, forms of raciality and coloniality and the differential distributions of human value and valuelessness that such campaigns struggle to recalibrate. The aim is not so much to amplify or recuperate jobs well done, but rather to pay heed to what Lisa Lowe has recently called the conjunction of “slavery, genocide, indenture, and liberalism” whose absences, erasures, and shadows continue to haunt our political present. Maria Faini is writing her dissertation in Ethnic Studies and Critical Theory, titled The Art of Occupation: Moral Injury, Artisanal Destruction, and a Politics of Non-Arrival. 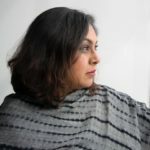 Her academic publications include pieces in Locating Life Stories: Beyond East-West Binaries in (Auto)Biographical Studies and Ada: A Journal of Gender, Technology, and New Media, and upcoming in a/b:Auto/Biography Studies. She is co-executive editor of nineteen sixty nine: an ethnic studies journal and co-founder of the Life Writing SNS Network.